Infobox Review 2019: Is Infobox a Good Hosting? 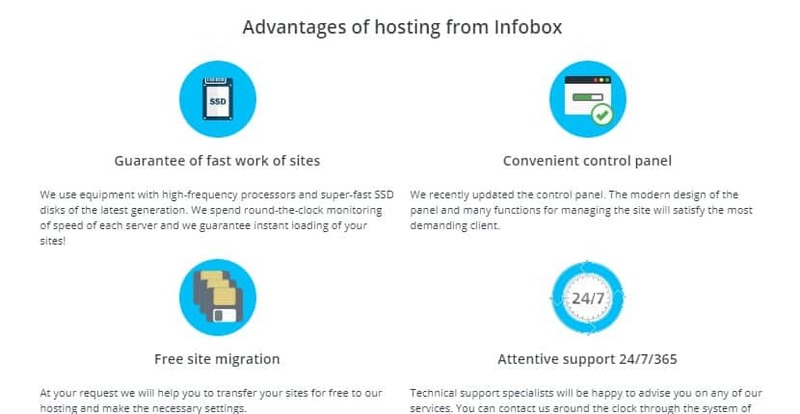 Infobox is a Russian web hosting provider with SSD servers in Europe and Russia providing both the traditional web hosting solutions well as more advanced cloud hosting solutions. The website hosting vendor charges its customers based on the number of websites you have. For over 16 years, Infobox has been the hosting vendor of choice for many businesses in Russia. The company also has a presence in Ukraine, Spain, Germany, and Kazakhstan. They pride themselves in providing both the traditional web hosting solutions like website placement, server placement and email as well as the more advanced cloud hosting solutions. The website is available in Russian. The Virtual Dedicated Servers plan delivers high-end architecture on ultra-fast SSDs. It guarantees you free traffic with a bandwidth of up to 100Mbps. It includes these three packages: Linux VPS, Windows VPS, and Cloud VPS. In addition to the package-specific features, Infobox hosting solutions have a built-in firewall that provides server-level security. With SSD servers in Europe and Russia, the company confidently guarantees low network delays. Using their experience and the highest industry standards, Infobox provides unrivaled hosting solutions to Russian enterprises across the entire country. The company has its own data center so that it can live up to its commitment of an uptime guarantee of 99.9%. What’s more, Infobox uses reliable and powerful green technologies that take less space and consume less electricity. All the software in their systems is the most advanced in the market so that it can deliver services that are consistently beyond their customers’ expectations. Infobox charges their customers based on the number of websites you have hosted on its servers. The prices are not exorbitant but the arrangement can sometimes seem odd for users used to a different kind of hosting. Even before you receive confirmation of your payment for hosting, they will already have deployed their staff to get started setting up your website on their servers. This can significantly shorten the time it takes to shift from your previous hosting vendor. Infobox offers free migration but does not have a free trial or a free version for any of its hosting plans. All the same, its hosting solutions are extremely flexible allowing users to specify their exact needs and creating for them a custom solution. You have to love the technical support team at Infobox. These highly-trained individuals are available 24 hours a day, 7 days a week, and have the knowledge and experience necessary to help you with all your hosting challenges. Indeed, they have many certificates from Cisco, Microsoft, Blackberry, 1C-Bitrix, and others to prove it. What’s more, their training process never stops. This means that the website hosting solutions that Infobox provides are always improving. The company uses the feedback it collects from its customers to adjust their support system to better be helpful to its customers. The team is super responsive, guaranteeing a somewhat comprehensive response not more than an hour from the moment you open a ticket. While it does not have a live chat, it has three support phone numbers. It took the Infobox support team almost three hours to get back to me when I contacted them, but this aligns with their statement that it takes them around three hours to respond to guest queries and they prioritize queries made by their existing customers. Infobox is the go-to website hosting company in Russia for small business, medium-sized enterprises, and large corporations. They provide high-quality cloud hosting, Dedicated Server hosting as well as Server placement and rental solutions for businesses in Russia, Ukraine, Spain, Germany, and Kazakhstan. Wondering how Infobox stacks up against other Web Hosting companies? Enter any other Web Hosting company and we will give you a side-by-side comparison.